Well, that's one way to quit your job. 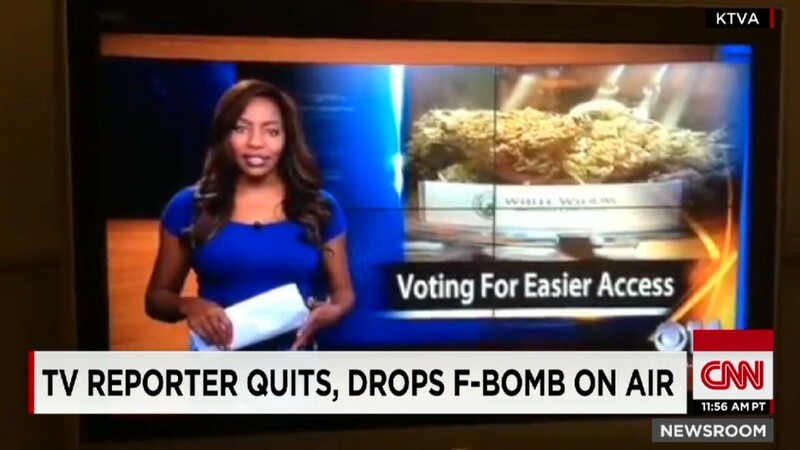 While doing a news segment on the Alaska Cannabis Club, a medical marijuana organization in Alaska, reporter Charlo Greene made a grand exit from her position at CBS affiliate KTVA in Alaska (caution: the video is NSFW). Greene revealed that she actually owns the marijuana club she was reporting on, and then quit her TV gig with some choice words live on air. "Now everything you've heard is why I, the owner of the Alaska Cannabis Club, will be dedicating all of my energy toward fighting for freedom and fairness, which begins with legalizing marijuana here in Alaska," Greene said on air. "And as for this job, well, not that I have a choice but, f*** it, I quit." The fact that Greene was so closely tied to an issue she was reporting on is a conflict of interest that would have forced her to step down, even if she hadn't made a vulgar statement. The ex-reporter told the Alaska Dispatch News that her dramatic exit was her attempt to bring attention to the issue of marijuana legalization, and apologized for offending anyone. Not long after the on-air incident, Greene created an Indiegogo campaign to raise funding ahead of the state's November 4 vote on legalizing recreational marijuana. "As a member of the media, I've seen the dirty campaign tricks and lies that prohibitionists have been using over the past several months to sway Alaskan voters firsthand," she wrote in a statement on the funding site. Greene also posted a YouTube video explaining her position. Meanwhile, after Charlo's on-air outburst, KTVA apologized profusely, on air and off. "We sincerely apologize for the inappropriate language used by a KTVA reporter during her live presentation on the air tonight," KTVA-11's news director Bert Rudman wrote on the station's Facebook page. "The employee has been terminated." Correction: An earlier version of this story misspelled Greene's name.